Some are rightfully skeptical that Kony will be captured by the 2012 deadline in the film. The more pessimistic will say that Kony is no closer to being captured than he was six months ago, and that things haven’t really changed. The LRA’s disparate brigades continue wandering the Democratic Republic of Congo, Central African Republic, and South Sudan, with rumors that some troops, including Kony himself, have sought haven in Sudan, an old ally. Rebounding from a piecemeal turnout for Kony 2012’s subsequent “Cover the Night” campaign, Invisible Children has moved on to other campaigns. The San Diego-based non-profit is sending out its fifteenth tour of roadies, interns tasked with showing IC films to audiences at high schools, churches, and community centers across the country. Their programs on the ground in Uganda and the DRC continue to serve war-affected communities. But the fact is, things have changed, and to truly see how things have moved in the past six months you have to look back a few years. 2008 marked a shift in how everyone looked at the Lord’s Resistance Army. From 2006 to 2008, a ceasefire was in effect while the LRA and the government of Uganda met for infrequent peace talks in Juba, South Sudan. The ceasefire allowed displaced people in northern Uganda to slowly return home, helping rebuild the region. Today, the town of Gulu, once the center of violence and the focus of Invisible Children’s first film, is a peaceful and bustling town with few signs of unrest. The peace in Uganda was so promising that, in December of 2007, Invisible Children’s founders announced to a gathering of 200 followers in San Diego that they would not be planning another national event to raise awareness of the conflict as expected. All attention would be on programs on the ground in Uganda and on following the peace talks in Juba. The supporters in the audience spent the rest of the day, and much of 2008, planning their own activities without direction from San Diego. In February of 2008, Resolve Uganda, a Washington-based grassroots organization lobbying for an end to conflict with the LRA, teamed up with Invisible Children to host a lobbying event to urge the U.S. to step up its support of the negotiations in Juba. Soon after, President George W. Bush appointed Tim Shortley as the U.S. special envoy to the peace talks. Huge progress was made during the talks, but both sides kept coming back to the issue of accountability and reconciliation. It all came apart in December of 2008. The peace talks had stalled for months, with Kony refusing to come out of the bush to sign a final peace agreement. He was concerned about the arrest warrants issued by the International Criminal Court, and he refused to sign the agreement until the indictment was lifted. Uganda’s President Museveni refused to back down. At an impasse, he did the only thing he knew how to do: launch a military blunder. After fruitlessly chasing the LRA across northern Uganda and southern Sudan for over twenty years, Museveni launched a multilateral invasion, supported by the U.S., of Garamba National Park in the DRC, where the LRA were enjoying safe haven during the peace talks. The operation was poorly executed and had vast repercussions. There were technical problems that resulted in a loss of air support and someone had tipped off the LRA leadership – the attack was a failure. The only thing it did was spur the LRA to lash out at local civilians, killing over a thousand across northeastern DRC in what are now called the Christmas Massacres. With the LRA roaming the vast, ungoverned regions of northeastern DRC, southeastern CAR, and western South Sudan, the conflict was fast retreating from attainable peace. The negotiations were shuttered and the Ugandan military, with South Sudanese and Congolese troops in tow, were in pursuit of the rebels. In the spring of 2009, Invisible Children premiered “The Rescue of Joseph Kony’s Child Soldiers” across North America and, for the first time, they put the video up online to reach a larger audience. The film grew out of Invisible Children’s role as an observer to the peace talks and chronicled the end of the talks and the subsequent massacres, with the trademark call to arms directing everyone to “abduct themselves” in April. After taking a break in 2008, IC was planning another national event, but this one would be different. In 2006 and 2007, Invisible Children had asked its supporters to take to the streets and parks for an overnight event. To shed light on night commuting, the journey of children from rural villages and displacement camps to town centers to flee abduction, 80,000 Americans commuted to 126 downtown areas and slept on the ground as a part of the Global Night Commute. The next year, attention was turned to camps where internally displaced persons (IDPs) were forced by the government and left to suffer due to malnutrition, rebel reprisal attacks, and abuse by the military. 70,000 Americans flocked to fifteen mock displacement camps where they watched videos about the camps to learn about their conditions and write letters to their Senators as a part of DisplaceMe. The Rescue was different. Where participants at the myriad GNC events were organized locally with some help from IC and the small number of Displace Me camps were organized almost exclusively from San Diego, the Rescue was bigger and broader. Over one hundred cities in the U.S., Canda, Mexico, the U.K., and Australia participated, each with meticulous coordination from IC headquarters. The huge undertaking would prove the foundation upon which American involvement and Kony 2012 would rest. The goal of the Rescue from the outset was that each of the camps would be populated by activists who “abducted” themselves by being led to the camp en masse. Those activists would remain there until “rescued” by gaining the attention of the media, politicians, or big-time celebrities – three groups IC perceived as being in the unique position to shed light on the crisis. If no rescuers came that first night, activist would stay until someone came. After being liberated by a slate of celebrities, activists in Los Angeles, Washington, and New York City boarded buses and rode to the nearest city still needing attention. Those rescued from other cities followed suit, caravanning from city to city. Throughout this process, a livestream on IC’s website showed events happening at different cities, following the Rescue Riders as they moved into the Midwest. It took a week for Chicago to be rescued. After six days of sitting in the rain, wandering through downtown, sleeping in a church, and chanting and dancing (video) outside Harpo Studios, a group 500-strong from across the country cajoled Oprah Winfrey into giving them some airtime. The weeklong struggle threw the cause of ending the LRA into the mainstream, with reports in the national news and #therescue trending on Twitter for much of the week. IC had hit it big. As a follow-up to mobilizing tens of thousands of people into city parks across the country, Invisible Children co-hosted the 2009 lobby days with Resolve Uganda and the Enough Project. After spending a day attending panels listening to everyone from International Criminal Court Head Prosecutor Luis Moreno-Ocampo to Bruce Almighty director Tom Shadyac, 1200 activists descended on Senate and House office buildings to talk about the newly introduced Lord’s Resistance Army Disarmament and Northern Uganda Recovery Act. It was the biggest lobbying push for any Africa-related cause, and the campaign lasted through the next year with constituent meetings occurring across the country. President Obama signing the LRA Disarmament and Northern Uganda Recovery Act of 2009 into law. In the Senate, the co-sponsors asked for the bill’s passage by unanimous consent, as long as no senators objected. When Tom Coburn of Oklahoma objected as a part of his object-everything-that-costs-money routine, Resolve Uganda responded. Activists associated with IC and Resolve descended on Coburn’s Oklahoma City district office, staging a sit-in. When Coburn agreed to remove his hold in exchange for explicit wording to control spending, the bill passed and the movement declared a victory. The House would pass the bill soon after, and it would become law with the most widespread, bipartisan support of any Africa-related bill in modern U.S. legislative history. This law would prove the backbone of Kony 2012. It provided $30 million for development in war-affected regions of northern Uganda and it required the State Department to develop a strategy concerning the LRA. This strategy, released in November of 2010, included increased coordination between the U.S. military and the militaries hunting for Joseph Kony. In October of 2011, President Obama made a late Friday afternoon announcement that 100 advisers were being deployed to the region to assist with training and intelligence to better ensure Kony’s capture. During the years between passage of the bill and the release of Kony 2012, things continued to shift. Invisible Children’s programs on the ground in Africa had previously consisted of rebuilding schools in northern Uganda, micro-lending and employment programs in IDP camps, and scholarships for war-affected youth. In 2011, Invisible Children expanded into the Congo, working on building an advanced warning radio network and helping build a rehabilitation center. They also partnered with a number of radio programs geared towards encouraging LRA members to come home. In the fall of 2011, Resolve and IC announced a collaborative project, the LRA Crisis Tracker, to use the radio networks and other sources to attempt to track LRA movements and create a tool to warn remote communities of imminent danger. According to anecdotal sources, Kony reportedly gathered his commanders and ordered his rebels to temporarily scale back attacks to avoid capture as American troops landed in Entebbe, Uganda. Less than six months later, Kony 2012 would drop. After spending seven years building a broad network of supporters and activists, Invisible Children released Kony 2012 online. The network of supporters succeeded in disseminating the film widely in the first day, and it took on a life of its own over the following weeks. It also created its own backlash as IC came under fire for a condescending narrative and an opaque budget. The group responded swiftly by redesigning its website to be more direct and by creating a page specifically to address critiques. Invisible Children CEO Ben Keesey answered questions submitted to the #askICanything hashtag. Co-founders Laren Poole (who left IC in 2011) and Jason Russell did interview after interview to explain their side of the story. Countless former interns and current staffers chimed in through op-eds and blog posts as scholars, aid workers, and people living in the affected regions joined the debate. Kony 2012: What Has Happened Since? Over the ensuing six months, as attention has ebbed, the offices of Invisible Children and Resolve have been busy. The United States government, governments in the region, and the LRA have also been busy. If you believe that non-profits can effectively urge governments to respond to atrocities around the world, these efforts stand as a shining example. If you are worried about the growing American militarization of Africa, things might seem like they are getting worse. The reality is that several things have changed in the months since Kony 2012, and it’s not entirely clear how what course these changes will take. In the months following Kony 2012, Resolve pushed for three major legislative aims. One, the Kony 2012 bill, was for Congress to reaffirm America’s commitment to helping see an end to the LRA. In a hearing regarding the October deployment of advisers, Principle Deputy Assistant Secretary of State for African Affairs Donald Yamamoto assured a Congressional committee that the deployment would last “months, not years.” The resolution sought to ensure that time tables did not hinder the training and advising necessary to help troops capture the LRA. 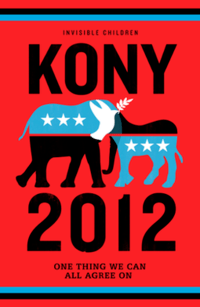 Resolve led a grassroots lobbying initiative on the coattails of Kony 2012, securing a number of cosponsors for the bill. Resolve also pushed for the State Department to expand its Rewards for Justice program, a bounty system used to help apprehend war criminals and terrorists, to include bounties for the top leaders of the LRA. There was also a push to ensure enough appropriations to keep development operations going. In late summer, the U.S. Senate passed the Kony 2012 resolution and the Senate subcommittee on defense appropriations included $50 million for expenses related to tracking the LRA. The bills have yet to become law, but as student groups reconvene in the fall, they will surely be setting up local lobbying initiatives to usher in more support for the movement. In central Africa, things have been changing rapidly. In May, a top commander of the LRA, Caesar Achellam, was apprehended by the Ugandan military, sparking a debate over his fate. A few weeks later, the Ugandan Parliament decided to abandon a decades-long amnesty process, allowing the Amnesty Act of 2000 to expire and leaving defection and reconciliation efforts in limbo. Meanwhile, across central Africa the expedition continues. Troops recently seized the camp of LRA leader Dominic Ongwen, closing in on one of the ICC-indicted commanders. The same week, however, the LRA abducted 55 people from two village in eastern Central African Republic, the biggest attack in two years. This demonstrates that any progress made in the hunt for Kony doesn’t mean the rebel group is any less deadly. Given the history of failed military attempts to capture LRA leadership, many are wary of the most recent Ugandan-led incursion into the bush. In an article in the Journal of Eastern African Studies [pdf], a number of researchers argued that “those who support the present military course of action seem to believe… [military involvement] will succeed against the LRA by doing more of what has not yet worked.” Indeed, John Prendergast, while ignoring some important geopolitical obstacles, suggested in an op-ed last month that Ugandan troops needed to widen their deployment area and that American troops needed their mandate expanded from training to active participation in the field. If the military option isn’t working after nearly a year, his solution is more military. Of course, to those who are skeptical of America’s military exploits, the adviser’s role smacks of the militarization of America’s foreign policy that is fast becoming a trend. This trend includes AFRICOM’s expansive role in sectors outside the traditional military realm and a growing aerial surveillance network from Burkina Faso to Somalia. The Pentagon is in the midst of talking about acquiring an airstrip in South Sudan, a prime vantage point for the tense relationship between Khartoum and its southern neighbor. This also comes at a time when Secretary of State Hillary Clinton is suggesting using drones to help in the search for Kony, a decision which could have huge effects, good or bad, on the effort to free his abducted victims. During the summer, the LRA Crisis Tracker released its mid-year report, outlining that the LRA was attacking more frequently, albeit less deadly overall. The rebel group was abducting more civilians in the first half of 2012 than it had during the last half of 2011, but many of those abducted were being released after providing the LRA with assistance. The most upsetting trends in the LRA are that most attacks have occurred in the DRC, where the Ugandan military force can’t pursue them, and that attacks in the CAR have become more deadly. While Ugandan forces have closed in on the rebels in eastern CAR, the LRA have responded with more violence. By the end of the first week, more than 112 million people had seen Kony 2012—about the same number who watch the Super Bowl every year. A Pew Research Center poll released 10 days after the film’s debut found that 52 percent of adults in the U.S. had at least heard of Kony 2012 and nearly a quarter of those ages 18 to 29 had actually watched it. But what about after that? Making Kony (in)famous was supposed to lead to action, and so far impunity reigns in central Africa. International disputes continue to play a role in limiting the force’s abilities (and will). The U.S. advisers are working in select camps, struggling to assist an under-resourced military in a vast region. Uganda’s Amnesty Act has expired, removing the primary incentive for soldiers to escape and defect. Six months after global attention turned to Kony, and almost a year since President Obama committed boots on the ground, the LRA continues to be a problem. If the current course of action hasn’t worked, do we stay the course? All evidence says that a purely military solution isn’t a solution at all. If the crisis caused by the LRA is to be abated, things will need to change. How things change will depend on decisions from four regional states, major powers, multiple multilateral organizations, and a huge number of civil society groups. It will be important over the next few months to watch how civilian protection, amnesty and reconciliation, international justice, and military efforts are addressed in the context of the LRA. Whatever happens, it seems pretty clear that this will take us beyond 2012. This entry was posted in Activism, International Affairs, International Law and tagged Amnesty, Central African Republic, DR Congo, Invisible Children, Kony 2012, Lord's Resistance Army, Resolve, South Sudan, Sudan, Uganda. Bookmark the permalink.